This model works with fractions of groups, like ¼ of 24, so ¼ would be a number, like 6. Example: One third of the students in the class are wearing blue. This model works with fractions of lengths, so ¼ would be a specific point on a line. Example: Measure to the nearest quarter inch. This model works with fractions of space, so ¼ would be an amount of space, or an area. Example: Cut this cookie in half. 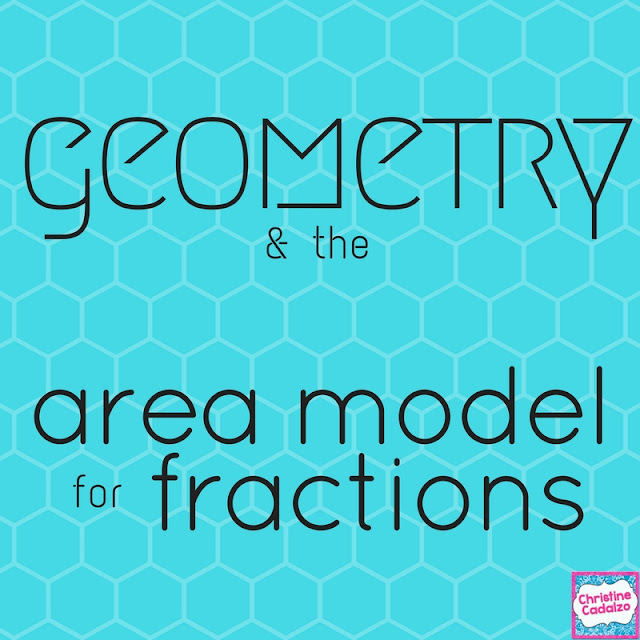 It's this last one, the area model, where fractions and geometry meet. This is where students learn to partition rectangles, circles, and other shapes into halves, thirds, fourths, etc. 1. Use geoboards and rubber bands. Kids tend to naturally be good at making patterns on the geoboards. Encourage them to divide the whole board in half, thirds, etc. This is also a great way to include a lesson or review on symmetry. 2. Cut and fold paper. Folding something in half and then half again is a simple way to make equal fourths. Fold it a third time for eighths. Students may fold their papers in different ways to make pieces that are different shapes, but they will be equal areas. 3. Divide up your classroom (or hallway or bulletin board or gym or playground). Use painter’s tape or chalk and lots of measuring tools. The bigger the space and the more fractional pieces, the harder it is. Good teamwork is needed for this one! 4. Make spinners. Have the kids trace any circular object (bowl, cup, any other container- be creative!) onto a paper and then try to divide it into 2, 3, 4, 6, 8, 10… equal spaces. They can use them for math games or they can make up their own fun spinners (like MASH when we were kids…). PRO TIP: This is also a great way for families to get involved. Have a fraction of the week and encourage them to have the kids cut all their food into that fraction. Start with halves, then move on to thirds and fourths… maybe even fifths or sixths for more of a challenge! 6. Make fraction art. Ed Emberley's book Picture Pie is perfect for this. Students can cut out fractions of a circle and make a collage. 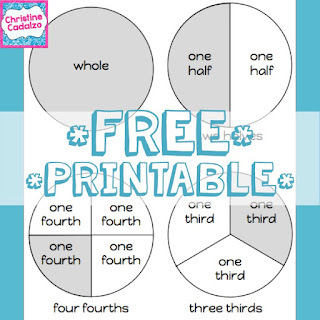 (For a FREE printable fractions of a circle template, click here.) This works particularly well for fractions of a circle, and is a great way for students to become more familiar and comfortable working with those fractions. This also builds important understandings for when students go on to learn about angles, later in geometry. Happy (fraction & geometry) teaching!! pssst... for a ready-made math unit for teaching geometric shares, click here. 1. Start small. When you ask a question, have students first discuss it with their partner. Then, have the partners pair up (groups of 4) and share. When students get comfortable sharing with a group of 4, start having them make groups of 6, then 8, then 10. Each time, students will become comfortable with a slightly larger group. Eventually, they'll be ready to share with the whole class. And they'll already have had lots of practice! 2. Scaffold reluctant or struggling students. Let them know that you are going to help them participate. Ask them what would help or what would make them feel more comfortable. One strategy is to choose one question you'd like them to share about and let them know the question ahead of time. Then they can prepare an answer and be ready when you call on them. Or, you can let the student choose which question they would like to answer out loud. Another strategy is to let the child know that you are only going to call on them when you know they have the right answer (because you saw it on their paper or heard them say it during turn and talk). This will give them the confidence to share their idea because they'll know it's right. 3. Allow for wait time. Giving kids time to think about their response is one of the best ways to improve participation (and the quality of the answers). When I ask a question, I tell students to put a thumbs up on their desk (or knee- if we're on the carpet) when they are ready. When everyone is ready, I call on someone to share. The students know they won't be called on until they are ready. 4. What you reward is what will improve. 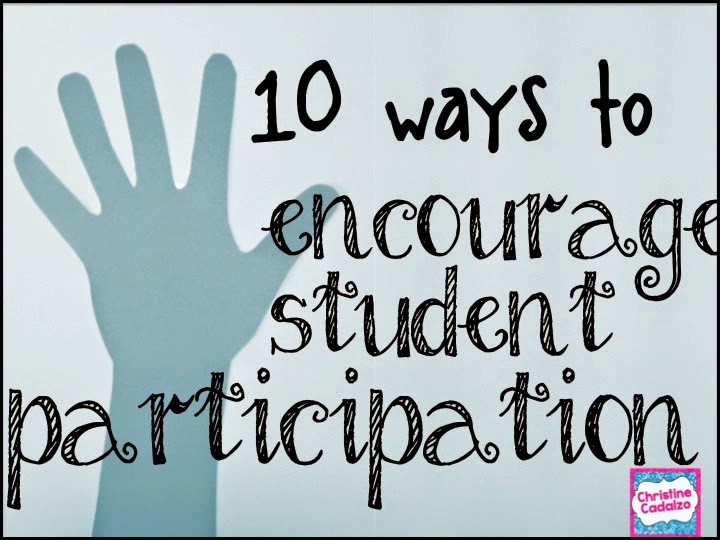 Rewarding and/or praising participation will bring it into focus in your classroom and will encourage more students to participate. You can reward individual students with stickers, tickets, or Class Dojo points, or give team points for good group discussions. Be sure to be specific when giving the reward: "I love how team 3 has all of their hands up to share." "J-- is getting a sticker because that was an excellent idea that she shared with the class." "I love how L-- wasn't 100% sure about his answer, but had the courage to share it anyway. That's really something to be proud of!" 5. Use cards to make sure everyone participates. 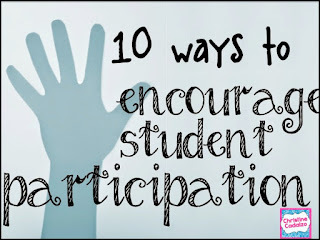 At the beginning of class, give everyone a participation card (it can just be a card that says "participation" on it). When they share, they turn the card in. They can still share after that, but they have "done their job" of sharing at least once, and the rest is bonus. At the end of the lesson, provide an opportunity for anyone who hasn't shared yet to speak. Reluctant students have three choices: they can share at the end, they can write down their idea/ answer and turn it in, or they can come over to you and share their idea/ answer to you privately. This sets up the expectation that everyone will share at least one idea during every lesson, and provides for student accountability. But, it also differentiates and gives your students choices for how to share. 6. Get the kids to "buy in." Have a discussion about why participation is important. How does it help us learn? How does more participation make our class more exciting and interesting? Explain how it helps you, the teacher, make decisions about what to do next. Talk about how explaining things helps you solidify it in your mind and understand it better. Chart out reasons why participating is important in the classroom and in life. 8. Use random chance to keep kids on their toes. Some teachers have a jar of popsicle sticks with each kid's name on it. Some of us use random name generators on our white boards or in Class Dojo. When a student's name pops up, it's his or her turn to share. This helps keep kids accountable, since they do not know when they will be called on. This strategy can be anxiety-producing, though, so make sure your students all feel comfortable sharing before you start implementing this. 9. Ask REALLY good questions. If your questions are open-ended, allow all students to access the ideas, and are interesting, your kids will want to answer! And they'll have tons to say about it, too. I was visiting another school recently, and the first graders had just finished reading "A Fine, Fine School." The teacher asked, "Do you think it's possible to learn everything you need to know by going to school?" Boy, did the kids have a lot to say about that! And, they were going back to the text to find evidence to support their answers! This question was perfect because there was information to support both sides in the text- there truly was no right answer. And everyone wanted to talk about it!! 10. Watch your responses. Ultimately, it's what happens when a student gets stuck or when a share doesn't go smoothly, that will determine how comfortable your kids feel. If students know they have a way out (Would you like to phone a friend or ask the audience? ), they will be more willing to take the risk of putting themselves out there. Another strategy is to ask, "Should we come back to you in a minute?" And then give the student a signal (I use a thumbs up) to show when he or she is ready to try again. For answers that have right and wrong answers, sometimes I'll say something like, "Well, no, but I really like the way you think." Or, I'll be light-hearted and funny and say, "Nope, but thanks for playing!!" Or, sometimes, "WOW- that was better than a right answer! It was a wrong answer with some really great thinking behind it!" This puts the emphasis on the quality of thinking and the process, which is what learning is all about. Happy Teaching (with Amazing Student Participation)!! What is a Math Menu? What goes on a Math Menu? I like to have a good balance of new games/ activities and oldies but goodies. I put in newer games to emphasize the concepts of the new material we are learning. And, I include games where students are practicing skills from previous units. I also include flash cards, math literature, and a rotation for math games on the computer. How does the Math Menu fit into the daily routine? There are tons of ways to manage the Math Menu, and, ultimately, you have to find what works for you, your tolerance for chaos, and your class. What I do is this: When students finish their independent work for the day, they close their book, leaving their pencil to mark the spot, and leave their book on their desk. Then, they go to the carpet/ back of the room to play something from the Math Menu. How do you organize the materials? 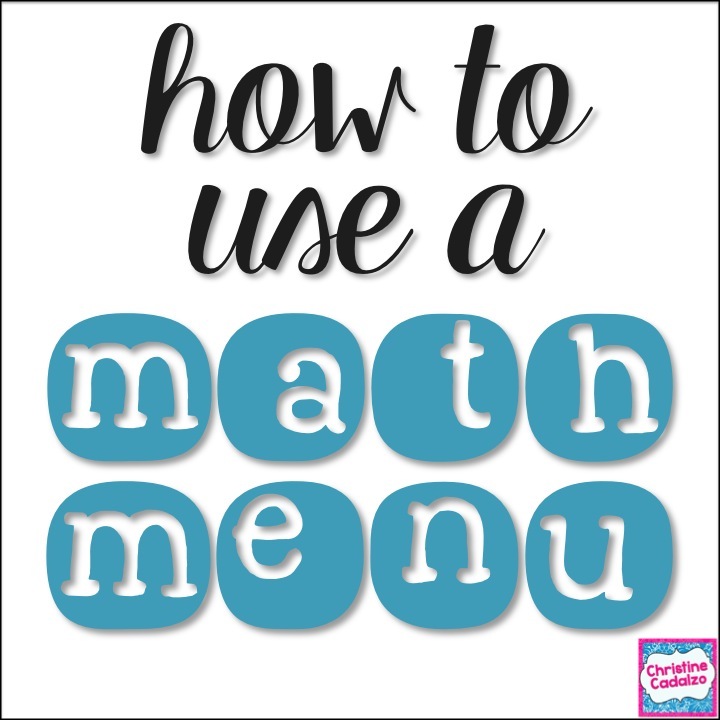 How can a Math Menu build skills? You can add games and activities that provide practice for the skills your students need to work on. For example, my students know how to subtract, but they make a lot of mistakes and need the repetition to become fluent. Rather than “drill and kill” it with worksheets, I put a few subtraction games on the Math Menu and have the kids use calculators to check themselves. And over time, their subtraction fluency is definitely improving!! How can a Math Menu be used to differentiate? There are a few ways to differentiate a Math Menu. One way is to use one color to write the games that align to one standard, and then a different color for those of a different standard. You can assign kids to a different color based on which standard they need to work on. For example, some students can be assigned only the blue games/ activities that support subtraction, while others can be assigned to choose from the red games/ activities for place value. And some students can choose from the entire list. Another way to differentiate is to create specific menus for each student. This can be complicated, so one way to simplify it is to type up your math menu and make one copy for each student. Then, you can highlight the games from which that student can choose, highlighting the games that align to that student’s specific needs. How often do you change the Math Menu? I like to make a new menu with every chapter (or two chapters, if they are related). I keep a few of the games from the current menu, add in a few from previous menus, and then start adding new games throughout the new unit. When the unit is over, I keep a few of those new games, rotate in some of the oldies but goodies, and start adding new games for the new unit. Kids tend to do really well understanding the concept of a number line and using it to count whole numbers. And they also are usually able to understand basic fraction concepts. But when it comes to putting the two concepts together- fractions on a number line- things can get tricky. Here's a look at why and how we can help. Why are fractions on a number line tough to understand? There are three models for understanding fractions. -There's the area model, which is what we are asking kids to understand when they are shading 1/8 of a pizza or 2/3 of a chocolate bar. This usually goes over pretty well, because students are able to see that the top number is the number of shaded pieces, and the bottom number is the total. No problem. -There's also the set model, which is what we use when we say we ate half of a batch of 12 cupcakes. This is a little more complicated. But it's also basically division, so if your students understand division concepts, they'll be alright. -The linear model is, in my experience, where kids tend to struggle. It's hard for them to understand why 3 marks on a number line creates halves. (Because it takes 3 lines to divide the line into 2 spaces!) Students sometimes have a hard time switching back and forth between looking at the spaces between the lines (like the area model) and looking at one point on the line (in the linear model). -Build on their understanding of the area model. Use visuals or concrete models to help students connect the idea of the spaces between the lines to the area model that they already know. -Relate it to measurement. Start with finding the point that is half an inch, or half a meter, or half of a liter even. Once your students develop the concept of a certain point being halfway, start working on fourths and other fractional parts. -Use a clothesline. Hang the different fractions with clothespins or paperclips. It's interactive because you can add more fractions, move them, or take them away as your class explores and develops the concepts. -Use tons of visuals. Connect the fractional number line to the whole number line by showing a magnification of the space between 0 and 1. -Use the number line to... count. Just like with whole numbers, practice counting on the fractional number line. 0, 1/4, 2/4, 3/4, 1. Have students point to each spot on the number line as they count. 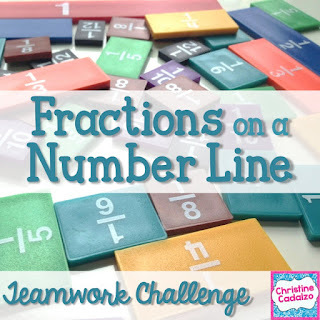 -Extend whole number line activities to fraction number lines. 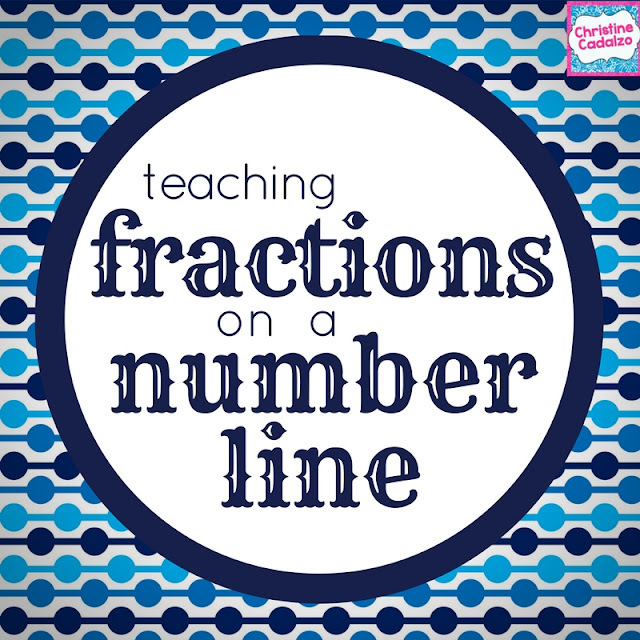 Ask your Kindergarten colleagues how they teach kids the number line (or check Pinterest!!). Do that, but with fractions! Click here to take a 2 minute survey and share your thoughts on teaching fractions. With testing season also comes the question: When we test in the mornings, what do we do in the afternoons?? We don't want to further stress our kids out or place high demands on them. But we also want to maintain order, and we definitely don't have time to waste!! 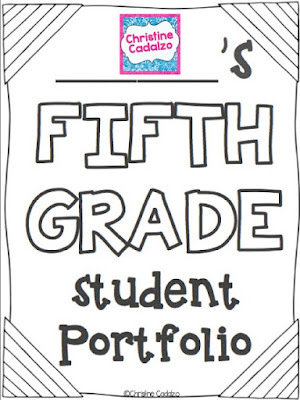 Here's one idea that has worked for me: Student Portfolios. We use three-ring binders for our student portfolios, so that students can put things in, take them out, and rearrange them with relative ease. I especially like the ones with the plastic sleeve covers and spines, so that students can make their own cover pages, back covers, and spine designs, and insert them into the plastic sleeves to keep them clean and looking professional (well, third grade professional!). 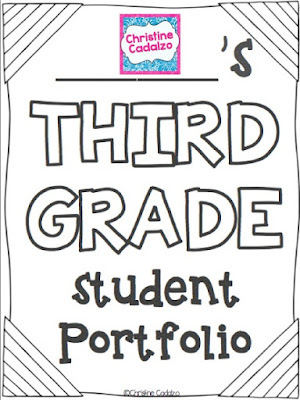 Usually, I like to have one binder for their entire portfolio, especially in elementary grades. I think this helps teachers and parents see the whole child, as opposed to focusing on an academic weakness in one area. 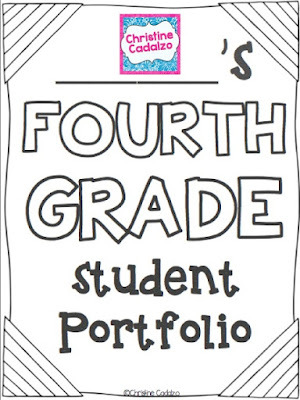 But, I have also used separate ELA and math portfolios, and it is helpful to have more space to organize each one by standard. Often, a math unit covers (or at least reviews) multiple standards, so the students can show off different work in different parts of their portfolios, even if it was from the same unit. The disadvantage to this is that they may have one project they are super proud of and have trouble deciding where to put it because it falls under several standards. 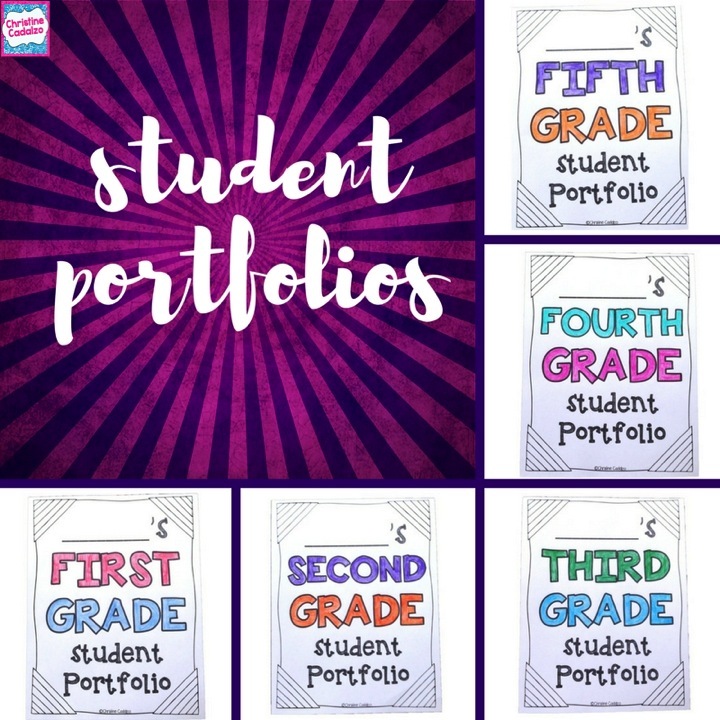 If you tend to do larger projects that encompass more strands, then it might be best to simply use one portfolio per student. PRO TIP: When working on student portfolios, I like to give my students a checklist to keep them on track. I include things like: color in the cover, put all your math tests in your binder in order by unit, and choose your very best work from ELA write a reflection for why you are extra proud of it. 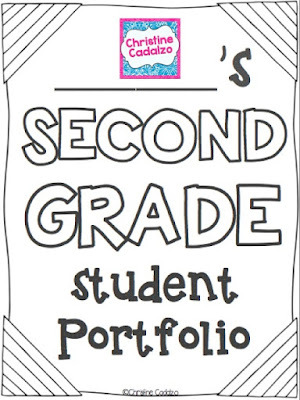 -Organizing portfolios is an administrative task that seems to take just the right amount of brain power. Kids can still have conversations, but aren't "all over the place." -It's a nice self-esteem balance to testing. Students can see how much they've improved since the beginning of the year, they can see how much they've accomplished, and they realize that yes, they have learned a LOT, no matter what happens with the test. -It's a stealthy way to review without actually reviewing. Kids will naturally be curious and flip through that math quiz from September or take another look at that writing piece they did in November. And when they do, they'll be reminded of what they learned and what mistakes they made. And this opens the door for them to ask a friend or the teacher for a quick explanation. -Organizing physical objects helps organize the brain. It's true! And we know our students have a ton of info floating around in their brains right now. -It involves coloring. We all know that coloring reduces stress. 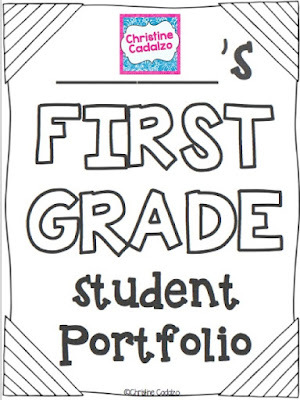 So why not let the kids color in their portfolio covers and tabs?? PRO TIP: Give kids TWO covers- one for the front and one for the back! Capture is an old, very basic card game for two players. Sometimes it's also called "war." It's a comparing game that can be used to practice just about any value- based concept in math. If you can compare two things and find which is bigger/ greater, you can create a capture game for that concept. 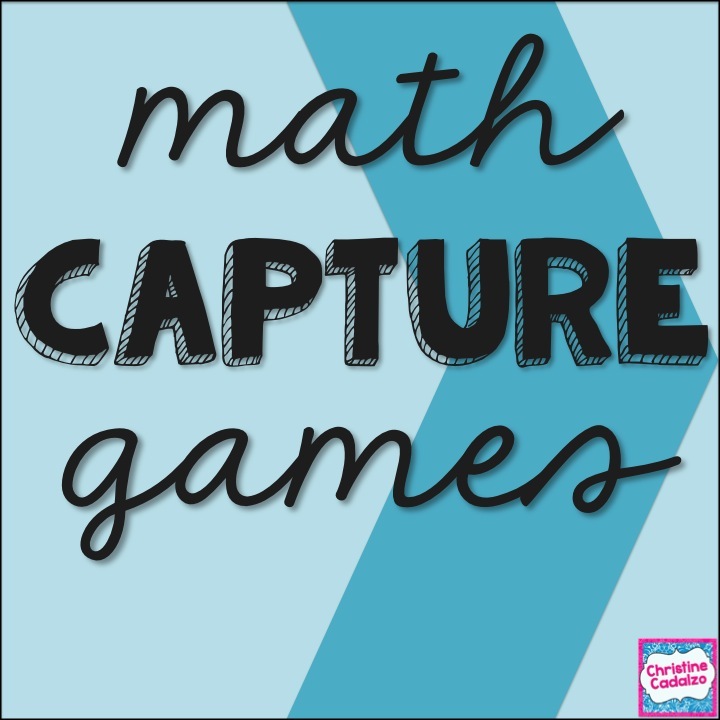 Why use capture games in math? 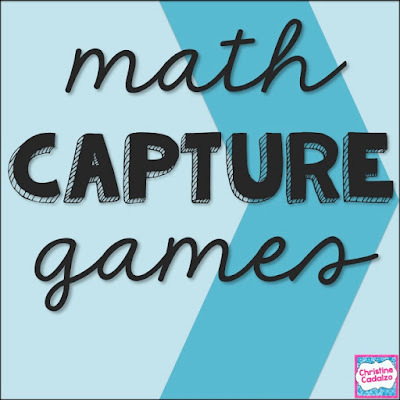 I love using capture games in my classroom, especially for math games. The rules are simple and the same rules can be used for any capture game. The only materials needed are cards that the students can compare. (I usually cut index cards in half and write on the blank side.) Capture games are easy to differentiate just by switching up the cards- swap out easier cards for harder ones as the students build their skills, or change the harder cards for easier ones to support students who need more practice. If you make your card decks so that each card has a matching pair, then the cards can double as memory game cards (where you place all the cards face down and try to match them up one pair at a time). Management-wise, capture games are great for early finishers. The game can be over and a winner declared whenever time is up. 1. Split the deck of cards in half. 2. Each player takes their half and stacks it face down next to them. 3. For each round, each player turns over their top card and places it face up in the middle. 4. The players compare the cards and the player with the card of greater value wins that round. 5. The winner of that round takes both cards and places them at the bottom of their deck. 6. Play continues until time is up or one player has collected all of the cards. If time is up, the winner is the player with more cards in their deck. 7. If there is a tie- both players turn over a card of equal value- then each player turns over a second card. The player who now has the higher value card collects all four cards and places them at the bottom of their deck. -1.NBT.5: use cards that have expressions of two digit numbers plus or minus 10. -2.OA.2: use addition/ subtraction expressions within 20. -2.G.1: use cards with polygons and compare the number of sides. Happy Teaching (with Capture Games)!! Students can work collaboratively to create a class yearbook or they can each create their own. They can include a page for each important event (field trip, assembly, etc.) that happened throughout the year. They can also add pages for each subject so they can record some of the most important things they have learned. The memory books or yearbooks can include "All About Me" pages, as well as a place for students and other teachers to write messages to each other. 2. Create an ABC book. Using one page for each letter of the alphabet, students can create an ABC book for a particular subject, or for the grade in general. They can use their books and anchor charts to review as they search for a word for each letter of the alphabet. Click here to get a FREE template. 3. Have the students become the teachers. Every student has something they know how to do and are really good at. Have them teach the others. They can even turn in lesson plans and create assessments! 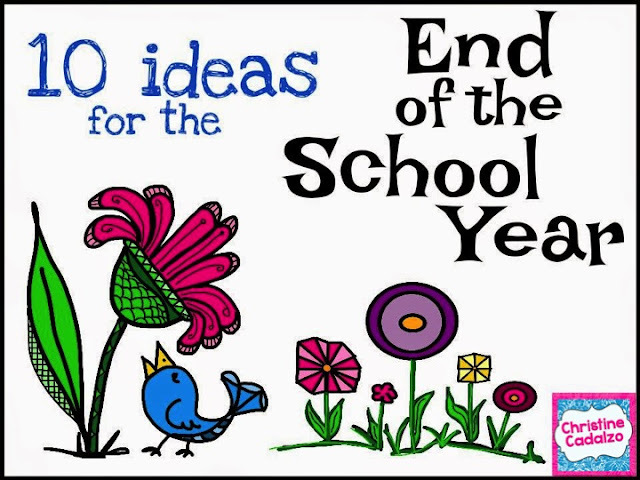 It will help them learn how to dissect a topic, plan out the steps to teach it, and develop their presentation skills. 4. Write letters to next year's students. Your current class can write letters to your future students. They can give advice and encouragement, tell them what makes your class special, and share tips about your grade or classroom. Have the students tape them to the inside of the desks for next year's class to find and read!! 5. Write a letter to your future self. Your students can write letters to their future selves. They can include all of their likes/ dislikes, what they think their future will be like, what they remember about their current grade. Give them to the parents to hold until a future date, such as their high school graduation or 18th birthday. 6. Get creative with awards. Of course, you could give out that "most improved math student" award. Or, you could give out "most likely to find the teacher's keys" or "best storyteller." Be creative and think about what makes each student unique. It'll show the kids that you really know them as people and that you notice their strengths beyond academics. 7. Do a final project. This is a great way to spend the last week or two of school. You can have the students each work on their own, or in groups. Come up with a way to synthesize the learning you have done over the year and tie it all together with a project. For example, in third grade, we are writing books about an animal from one of the countries we have studied this year. We are researching and including information about their habitat, diet, etc. We are using data to create a chart or graph for our book. After researching and organizing the information, students will draft, revise and edit, and publish. 8. Make a video or podcast. Another great project for the end of the year. Assign roles and tasks and work as a class to create one video/ podcast that the students can keep as a kind of digital memory book. It could be full of interviews, photos, collections of things done of the year, etc. 9. Create a summer bucket list. This is a fun way to get the kids ready for summer. And you can help them sneak in lots of learning by giving them ideas like "read under a tree" or "learn more about kangaroos." 10. Invent a math game. Kids love making up games, especially if they can play them outdoors. Assign each pair/ group a standard or concept and have them come up with a fun way to teach or practice it. They can write out the directions, make all of the pieces, and teach the class how to play. And then you'll have some new ideas for next year's math center!! Happy (End of the Year) Teaching! !